Who doesn't remember the wonderful, warm aroma coming from the kitchen as Mom was baking cookies? With 250 recipes to choose from, you'll find an extraordinary range of cookies for every occasion and for everyone from young to old in this complete cookbook. Looking for the perfect accompaniment to your next cappuccino? Chocolate Walnut and Chocolate Nut Coffee Biscotti fit the bill perfectly! And with cookie swaps becoming so popular, choosing just one recipe will be really tough. Whether you choose The Ultimate Sugar Cookie, Chocolate 'n' Vanilla Spirals or Butterscotch Pecan Cookies -- all are sure crowd pleasers. And of course no holiday occasion or gift basket would be complete without Hanukkah Sugar Cookies, Cherry Valentine Cookies, Thanksgiving Pumpkin Spice Cookies or Holiday Cranberry Cookies. The recipes are broken down into easy to find and follow sections: Drop Cookies, Hand-Shaped Cookies, Sliced Cookies, Biscotti, Sandwich Cookies, No-Bake Cookies, and Holiday cookies. Helpful baking tips are featured throughout the book as are ingredient methods (for example the correct way to melt chocolate), storage methods and even a cookie troubleshooting section. If you love to bake (and eat!) cookies, this is an absolute must-have for your kitchen. Another amazing cookbook from this author. Being a father to small girls you can bet they love cookies and this cookbook delivers. With 250 recipes you will be kept on your toes for some time with this. What was nice though is that the cookbook was easy to understand and the cookies were easy enough to make. Our favorite so far are the crispy caramel haystacks, but I have already been earmarking pages for other ones that look delicious too. There is a little bit of everything for any cookie lover in this book. As in another book from this author that I reviewed, i would have liked to have had more images, but what you get is still great! 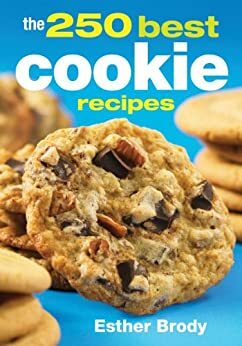 If you love making cookies you will love this cookbook!